Once a major hurricane, Madeline was a tropical storm that appeared shapeless on a visible satellite image as it was passing south of the big island of Hawaii. An infrared image showed the storm stretching from southwest to northeast. 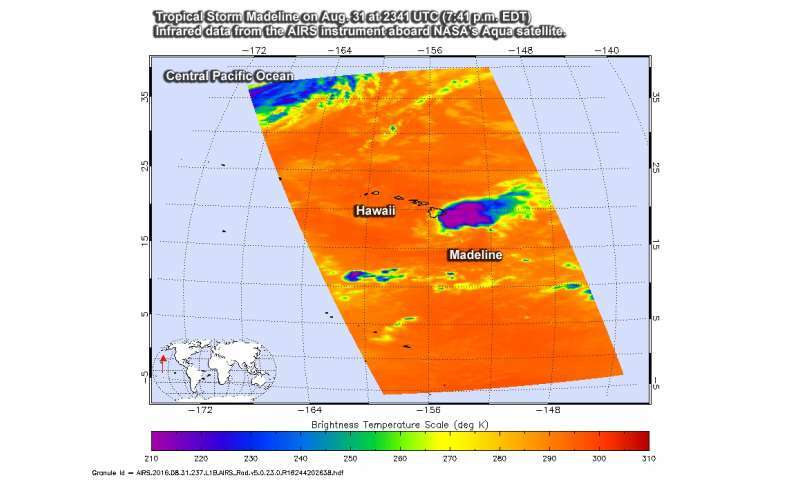 The Atmospheric Infrared Sounder or AIRS instrument aboard NASA's Aqua satellite provided an infrared look at Tropical Storm Madeline on Aug. 31 at 2341 UTC (7:41 p.m. EDT). Infrared data shows temperatures and the stronger storms with coldest cloud top temperatures were confined to the northeast quadrant of the circulation. Those strong storms were becoming more distanced from the storm's circulation center. On Aug. 31 at 6:50 p.m. EDT (22:50 UTC) the Visible Infrared Imaging Radiometer Suite (VIIRS) instrument aboard NASA-NOAA's Suomi NPP satellite provided a visible image of Tropical Storm Madeline approaching Hawaii. In the image, Madeline appeared to be almost shapeless. 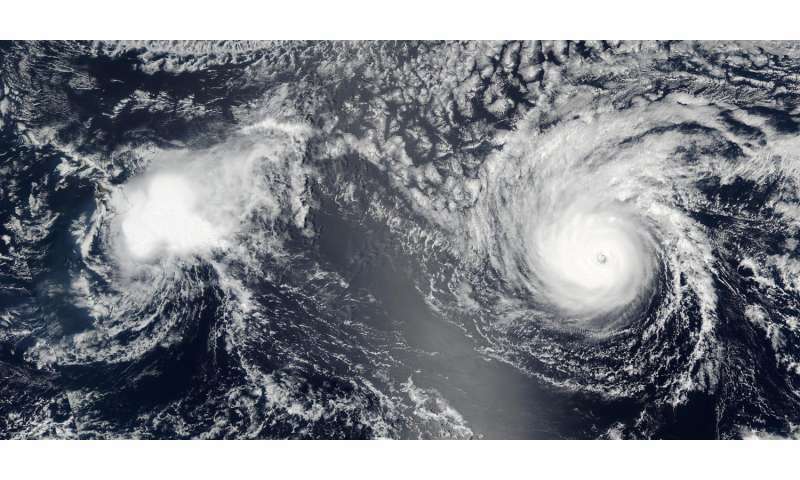 Madeline weakened to a tropical storm on Aug. 31 by 8 p.m. EDT (2 p.m. HST). At 11 p.m. EDT (5 p.m. HST) on Aug. 31 Madeline was passing just south of the Big Island of Hawaii as a tropical storm with maximum sustained winds near 65 mph (100 kph). At 11 a.m. EDT (5 a.m. HST/1500 UTC), forecaster Birchard of NOAA's Central Pacific Hurricane Center (CPHC) noted "After a several hour period where Madeline had a rather ragged satellite presentation, a burst of deep convection developed near the center around midnight, and has since persisted with an abundance of lightning." At that time the center of Tropical Storm Madeline was located near latitude 16.7 degrees north latitude and 157.0 degrees west longitude. Madeline is moving toward the west near 14 mph (22 kph) and this general motion is expected to continue for the next couple of days. The estimated minimum central pressure is 1003 millibars. Maximum sustained winds are near 50 mph (85 kph) with higher gusts. Some weakening is forecast during the next 48 hours, and Madeline is forecast to become a Tropical Depression by Friday, Sept. 1. There are no coastal watches or warnings in effect in association with Madeline anymore in Hawaii. However, interests on Johnston Island should monitor the progress of Madeline.